Posted by MORSE Team - 6 min read. 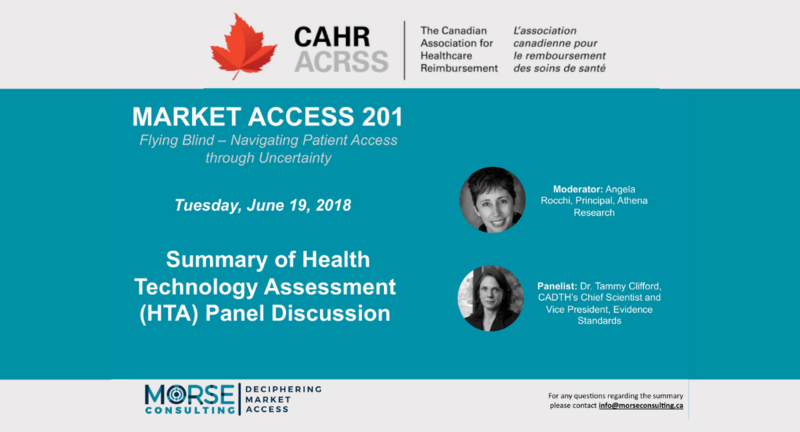 Panel Description: Canada’s centralized HTA agency, CADTH, has recently released a new 3-year strategic plan that marks a shift from its previous vision. Noteworthy is the focus of recommendations on alignment of drug assessment with the priorities of the participating plans over all phases of the technology life cycle. Join us to hear CADTH describe their new strategic plan, how their mandate has evolved, why change is needed, and the implications for industry. Angela Rocchi: We chose to take a broad lens for the HTA session because as Dr. Jeffrey Hoch [emcee] said, there are so many moving pieces at the federal level. We wanted to be comprehensive with a broader picture. We touch on CADTH, but not everything is CADTH related. The question on how CADTH will implement Pharmacare is not an answerable question for example. We are going to look at the strategic plan and concurrent federal initiatives. Tammy Clifford: I referred to this talk as doing something “unplugged.” CADTH is an independent organization funded by the federal and provincial governments. We provide evidence and decision-making tools to provinces. CADTH offers various services and programs including the Common Drug Review and the pan-Canadian Oncology Drug Review. We also do rapid response reviews and the scientific advice program. Angela Rocchi: Who writes the strategic plans? Tammy Clifford: It is something the CADTH board has responsibility for. Our previous strategic plan was three years in length, and the board is a hybrid board. It includes jurisdictional representatives and individuals from academia, the public and health authority levels. It is led by an independent chair. The year before the plan expires, the board will hold a retreat to see if the plan still makes sense and given the environment, are there things that need to be added. It is not just a document that sits on our desks, it drives the activities of CADTH. Out of each plan we come up with an annual business plan. A few years ago, we had five-year plans, and there was one plan we did not get past year four. So now we do three years. Angela Rocchi: Why were these objectives perceived as what CADTH should be working on and were they met? Tammy Clifford: We are evaluated against these at regular intervals. Health Canada evaluates us at the midpoint and endpoint as well. Delivering value is getting the right information to the right people at the right time. It will appear in each of our plans. Making sure the processes are as efficient as possible. At the start of this plan, we had just come through the backlog and didn’t want to see that again. We also wanted to implement greater transparency. It was felt at that time to be something worth documenting. Expanding reach will likely also be in future plans recognizing that there a lot of people who make decisions in our healthcare system, so we want to make sure they are included. In terms of setting the standard, I do think it’s important for any agency to be viewed as leading the methodological charge. We are always on the lookout to improve the work we do, whether that’s through building capacity or working with academics. Here is where we introduced the scientific advice program. Angela Rocchi: Were the guidelines part of setting the standard? Tammy Clifford: Yes definitely, it took a little longer but still important. Angela Rocchi: There were places where the former plan fell short so what does the new plan address? Tammy Clifford: You’ll notice that the objectives discuss closing the gap between evidence, policy and practice. We also work to strengthen engagement with physicians, patients and other stakeholders. This includes industry. There is an industry liaison forum which includes Innovative Medicines Canada and BioteCanada – we have open discussions at this forum. If there are messages you want to get to that table for industry, going through those organizations is key. Providing customized implementation support is taking us from HTA to health technology management (HTM). Being an organization which gives more support to the system. Not every province will need this, but some have asked, and we have developed a small hub in Saskatchewan. We have CADTH staff there to help take what comes out of CADTH and contextualize it for that local jurisdiction. We are here to support. The type of support we provide changes over time. Angela Rocchi: I think some of the HTM leads into the second set of objectives? Tammy Clifford: Move to a lifecycle approach to HTA, which is typically been quite preoccupied with adoption. For good reasons, however, we have realized there are opportunities to work further upstream with the scientific advice program. We felt we have a role to play in informing manufacturers on what an HTA body would be looking for in terms of evidence. It gave no one satisfaction for a drug to come to an expert committee, to be a “no recommendation” such as not having data on a particular outcome. With the scientific advice program, there is more of a conversation going on up front on data needs. As we’re trying to provide earlier access to interventions to the Canadian population, if things are being pulled back, is there a mechanism in place to revisit the data? That is what the life cycle approach is about. We are not reassessing every drug and technology. We don’t have the capacity to do this. There is going to be some thinking that is going on about which technologies need a reassessment. What is the mechanism for triggering that? Waiting for more robust data or a new trial for example. Angela Rocchi: As we evolve our pathways are the therapeutic reviews going to be more common? Tammy Clifford: The desire is to expand our focus and to think about what patients and the health care system needs. Options can be surgery, pharmaceuticals or devices, so the intent is to get to that care pathway situation to really inform the physician/patient interface and the funding decision to follow them. New Zealand, for example, has been doing good work in the models of care approach. We are not trying to reinvent the wheel. Angela Rocchi: How do you decide what priorities to focus on? Tammy Clifford: There is always more to study than we have capacity to do. We know there is a quite a bit of demand and we need to make sure we are working with individuals across the country. Can we use others’ work? Adapt it? Build on it? Right now we have a criteria-based system. Formulary review programs, what comes in first gets dealt with first and moves through. For larger programs, we’re looking at population impact, equity issues, indigenous priorities and looking at the minister’s mandate letter. It will be an exercise that is criteria based. Its seeking input from the system, patients, clinicians, payers etc. and making sure we are not duplicating work. Angela Rocchi: The word ‘disinvestment’ – what does that mean to CADTH? Tammy Clifford: I am okay with ‘reassessment’ because that provides opportunities to continue to invest or disinvest but that is someone else’s decision. By disinvesting from things without benefit, it provides room for new more effective products. To permit that spending to be reallocated elsewhere. 30% of what we spend could probably be spent better. We are not the decision makers or the payers. Angela Rocchi: Those low-value interventions are also low price, then how are we creating headroom? Maybe that’s more about appropriate use and the care pathway to reduce inefficiency. Tammy Clifford: The Triple A’s, you can find those savings through appropriate use. Angela Rocchi: These core values, three are the same as the current plan. The one that was dropped was leadership in favor of transparency. What does the pharma world need to know? Tammy Clifford: I don’t think there was a deep conversation about that shift. In terms of transparency, I think that is for CADTH to own. We often remind people that we point our finger to a lot of individuals and have to remind ourselves that we need to be held to the same standard. I daresay the answer is no. In terms of the projects we do or redactions, there are lots of things we can do better. It reflects the spirit that given we have a lot of federal funding, the expectation is that we have data available for others to use. Each fall CADTH hosts a drug information session, which is an opportunity to hear from stakeholders. Things are changing, so we can’t act on things unless we are hearing from you. Angela Rocchi: Fit for Purpose is a review of pan-Canadian organizations which overlaps with Pharmacare Now. I pulled out some of the specific points which referenced drug programs and certainly Brian O’Rourke is quoted on CADTH being a good hub for the formulary. Tammy Clifford: Both documents do speak to the need for change. The status quo is not an option for this Minister. CADTH is likely to expect some direction, and it could change the landscape of these organizations. That being said we welcome that change because we have realized that parts of the system are not working well together. When each organization has stood up with its own board or plan, there has been very little alignment. We are hoping to use RWE, so can we make these organizations get more in sync. We are waiting on the Pharmacare Now piece, there are a lot of moving pieces. Going along with that consultation is important not just with bilateral parties but a larger group of the entities that are involved. For us, it is a bit of wait and see. “Triple A”: Health policy goals of appropriate, affordable, and accessible care.